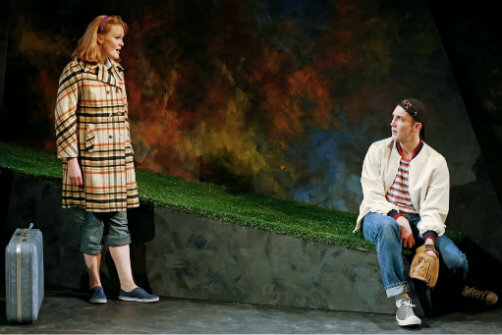 Kate Baldwin and Conor Ryan in John & Jen. Photo by Carol Rosegg. BOTTOM LINE: While certainly worthwhile for musical theatre completists, this production of John & Jen is hardly a must-see for everyone else. It’s always interesting to look at a now-famous composer’s early work. Unless you’re an inveterate collector of cast recordings (like I am), you may not be familiar with Andrew Lippa’s first musical John and Jen. It’s certainly a producer’s dream – two actors and no specific set requirements. And while The Keen Company’s desire to revisit this delicate piece is understandable, this production highlights John & Jen’s flaws more than it showcases its strengths. In the first act, John (Conor Ryan) and Jen (Kate Baldwin) are siblings. Jen is six years older, and spends much of her energy protecting her younger brother from their (unseen) abusive father. But Jen also yearns to escape; after she leaves for college, their close bond begins to fray. John’s idolization of his father heightens, and the political differences between the two siblings intensify. By the end of the act, John and Jen have grown up but have also grown apart, and Jen comes to believe that she has irredeemably failed her promise to protect her brother. In act two there is a new John in Jen’s life – her son. A single mom, Jen doesn’t want to make the same mistakes with her son that she did with her brother. And of course John the son rails against what to him feels like a suffocating, over-protective mother. John & Jen is clearly a musical about growing up, and for it to work, we need to be conscious of each stage in the characters’ development. Ultimately, this is the biggest problem with this piece – at least in this production, one never gets a clear idea of how old either character is unless it is mentioned outright. Part of this might be the writing – Lippa’s score is beautiful at times, but the musical vocabulary is so consistent that songs sung by a six-year-old sound the same as those sung by an adult. But ultimately I fault the direction and performances. While I suspect Ryan and Baldwin and director Jonathan Silverstein worked hard to avoid many of the clichéd choices that adult actors playing child characters often resort to (higher-pitched voices, child-like mannerisms), the end result is that these characters seem to remain the same age throughout the entire show. Certainly costumes are another way to signify changing ages. Not only do Sydney Maresca’s designs help with this, but they also subtly indicate the changing decades (the musical spans 1952 to 1990) without being too on the nose. Less successful is Steven C. Kemp's abstract set; while literalism isn’t required for this piece, the markedly geometric shapes and minimalist design kept making me think I was in the Museum of Modern Art. There are definitely some lovely moments. Both Baldwin and Ryan have beautiful voices, and if taken just as a collection of songs (since it is pretty much sung-through), John & Jen works well. Perhaps the most memorable moment is Jen’s powerful 11 o’clock number “The Road Ends Here,” when it becomes clear that, even after becoming a mother, Jen has not stopped growing up. But if all you want is to hear Lippa’s music sung beautifully, there’s the John & Jen cast recording featuring the amazing Carolee Carmello. I want more from a live production, and sadly, this is something that the Keen Company’s revival does not deliver.